At Heart of West Michigan United Way, we recognize that making real community impact requires that we understand the community’s most pressing needs. To do this, it is critical that we understand the concerns, challenges, and lived experiences of the people and organizations that make Kent County a vibrant place. It is also imperative that we understand systemic issues that contribute to inequities and disparities in the community. It was with these goals in mind that United Way brought together Kent County residents to participate in two Community Conversations on challenges, needs, and opportunities for growth within our community. 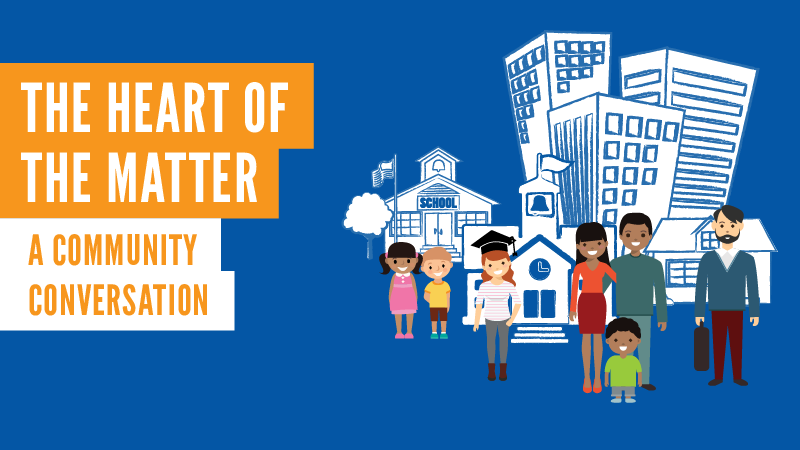 United Way’s Community Conversations mobilized community members to engage in dialogue on critical issues within the organization’s three focus areas of Youth Education, Financial Security, and Family Stability. United Way worked to recruit a diverse cross-section of community members with different life experiences and perspectives to participate in the discussions. This included nonprofit professionals, businesspeople, students, local activists, and clients at our partner agencies. Our intention was not only to gain a variety of different perspectives, but also to help bridge cultural divides and facilitate collaborations around community issues.